We look forward to seeing you on Saturday, April 27, for what promises to be another great race! The Race begins at 8:30 a.m. at Zion Evangelical Lutheran Church, Fellowship Hall, 96 East Allendale Road, Saddle River, NJ. Please allow time for parking and getting to the start line. We line up at 8:15 a.m. sharp! We are expecting over 600 runners and walkers, so we suggest you carpool or walk if possible. Post race celebration at Zion Evangelical Lutheran Church includes refreshments, live music, awards ceremony & children’s activities. *In accordance with the Internal Revenue Service regulations, tax deductibility will be determined by sponsor level and number of participants. Fair Market Value is $15 per participant. Lincoln Electric Products Company, Inc. Since its inception in 2012, the Susan Zabransky Hughes Memorial Run, including gifts from the Hughes and Zabransky families has raised more than $2 million. The Hackensack University Medical Center Foundation and the Run for Sue Committee continue to fund a memorial scholarship by helping to support the education of two promising students at the Hackensack Meridian School of Medicine at Seton Hall University. The two exemplary scholars chosen began their studies during the summer of 2018. Funding also continues for a two week summer camp program at Pony Power Therapies in Mahwah, NJ for patients treated at the Joseph M. Sanzari Children’s Hospital at Hackensack University Medical Center. This equine therapy program offers pediatric patients the unique opportunity to engage in horseback riding, horse grooming, gardening, and additional farm related activities. Funds have helped to complete Susan’s Suite, a ten bed unit for patients with cancer requiring treatment at the Emergency and Trauma Center at Hackensack University Medical Center. We are grateful to the dedicated sponsors, donors and participants who have supported these endeavors. Sponsorships must be received by April 7 in order to be on signage and race t-shirts. This run is organized in honor of Susan Zabransky Hughes, a loving mother, wife, daughter and friend who lost her battle with cervical cancer in July of 2011 at the age of 46. Seven years ago, a group of Saddle River women who knew Susan Zabransky Hughes and her love of running, came together to raise money for a project that was worthy of her memory. Working together, these women formed the Run for Sue Committee. Sue impacted the lives of many through her dedication to volunteer services, sharing her love of cooking, training at the gym, hiking at the Reservation, and vacationing. Sue loved life and lived it to the fullest every day. This run takes place in historic Saddle River, which pays special homage to Sue. The course includes some of the same streets she ran on, and the neighborhood where she lived for 15 years while raising her family. As an additional tribute, the course reaches into Upper Saddle River where she grew up. The funds raised by The Susan Zabransky Hughes Memorial 5K Run have far exceeded expectations and continue to help us in the fight against cancer. 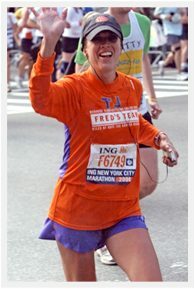 We invite you to join us in honoring Sue by making a donation to the Susan Zabransky Hughes Memorial 5K Run/Walk. Thank you for your generosity and support!